Sometimes artists don't get the credit they deserve. They work for years to get noticed and even then, a lot of the time they don't gain the notoriety they deserve when their work is done behind the scenes. Which is a great segway to Ryan Tedder's introduction. Long story short, in 2001 soon after he graduated from Oral Roberts he caught Timbaland's eye via an MTV talent contest. See him below performing one of my favorite unreleased songs titled The Look in 2000 on MTV. Yea for all of you at home, that means he's been creepin' on a come up for damn near a decade. I love that Brian McKnight openly gave him props on the performance right afterward too...was very fitting. Pretty good for a kid who learned how to play the piano at the age of 3 using the Suzuki method, which basically means he learned how to play by ear instead of through learning notes...oh yea and if you watched the video he also learned how to play guitar by listening to Dave Matthews in college...hah must be nice! Needless to say you probably know his voice as being the lead singer of the band One Republic and providing you the lead vocals to their songsApologize and Stop and Stare. He started the group One Republic in 2002 with his high school friend Zack Filkins and since 2004 have been a Myspace product, getting over 30 million plays since 2004. That's the side of him you know, so now that you have a little familiarity with who he is, I'm going to get you all learned on what he does behind the scenes...you know where real artists work to produce that great finished product you end up hearing. If you want a longer list of his production and writing credits go here, but his highlight reel includes writing the tracks Apologize by One Republic (obviously), Bleeding Love by Leona Lewis, Halo by Beyonce, Long Gone by Chris Cornell (favorite of mine) more recently Battlefield by Jordin Sparks. Must be why he was up for two Grammys in 2008. Personally my underground favorites of his writing include Damn Thing by Josh Hoge, Please Don't Stop the Rain by James Morrison and Break Anotha by Blake Lewis...again just my opinion...but on the real quit sleepin' on these! Oh yea and you knew I'd save the best for last. His writing, singing and performing all showcase his incredible talent, but my question is have you heard him demo some of these tracks?? You wanna talk about a bad decision, having him demo a track, then you try and do it better. So far, Jordin Sparks was the only one to barely escape that trap because she absolutely killed Battlefield in her own right. Here are my four current demo favorites plus a bonus in hopes of me finally getting you to develop an appreciation for this insanely talented singer, songwriter, and MegaTron of a musical act. 1. Ryan Tedder - Everything (Demo for Leona Lewis) No Way She Does it Better!!! 1. Ryan Tedder - Gravity (Demo for Jordin Sparks) Again, No Way She Does it Better!!! 3. Ryan Tedder - Battlefield (Demo for Jordin Sparks) Great Demo!! 4. Ryan Tedder - History (Demo for Menudo) New Demo! Oh so you also heard One Republic has a new album coming out in November? That must mean you have heard their new single All the Right Moves?? Betcha can't guess who wrote and produced this one?? One Republic - All the Right Moves Hoootttttttt New Single!!! Bonus x2: You know I couldn't leave ya hanging on the first track that got him on the map too. 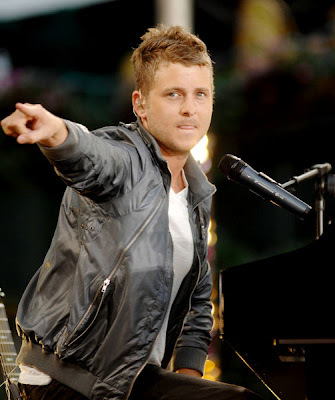 Ryan Tedder - The Look CLASSIC!!! Thank you for a great tribute to Ryan Tedder! He is supremely talented.